You don't need to spend a fortune on grooming tools to keep your dog looking good—in fact, many tools are only really necessary if you want to enter your dog in shows. To get a respectable, trimmed look, you only need a few essentials. It's a good idea to have a brush you can use to remove loose hair from your Aussie's coat before you go in deeper with a rake and scissors. The brush can be used as part of a regular grooming routine, but you can also brush your dog on a daily basis if you think it's necessary to stop her hair from tangling and matting too much. You should have a pin brush as well as a softer brush. With a few pieces of dog grooming equipment you can help keep your Aussie looking their best and their fur free of parasites. A comb serves the exact same purpose for a dog as for humans: it helps remove tough tangles and knots from the hair. It's a good idea to have a tough steel comb for an Aussie. You may want to have two or more combs. It pays to have at least one fine toothed comb and one wider comb, so you can go through the coat first and get the bigger knots out before you focus in on thinning out smaller tangles. Many combs designed for dogs have two sides, one of which is thick and the other of which is fine-toothed, so this can save you from having to buy two. You don't need an entire arsenal of scissors to groom your Aussie—however, to do it right, there are two types of scissors you should have. The first is a set of thinning shears. These help you work quickly while not cutting off big chunks of hair all in one go, which means you'll be less likely to make a mistake your can't fix. The other thing you should have is a set of fine scissors—these are used for trimming the hair around the dog's ears and feet, where precision is particularly important. GoPets Dematting Comb with 2 Sided Professional Grooming Rake available on Amazon. A rake is a wide tool that looks similar to a brush, and it serves a similar function. The rake is great for stripping off loose fur before you bathe your dog or trim her coat. It means you won't have to be trimming through a whole lot of fur that is on the verge of falling out. The last really essential piece of dog grooming equipment is a set of nail clippers. If you don't trim your Aussie's nails on a regular basis they'll end up getting overgrown, which can cause several problems. First, they may crack on their own which can lead to infection. On the other hand, they can be problematic for you and other people if your dog has a tendency to paw at you or jump up. 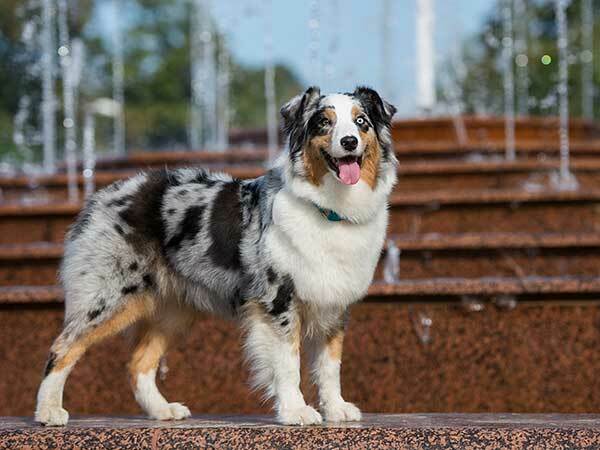 If you don't want the hassle of spending money on a whole lot of dog grooming equipment but you still want to keep your Aussie reasonably well-groomed, you might want to consider using a tool like the FURminator. This dog grooming tool is designed specifically to reduce shedding by removing loose fur from the undercoat. If you want to make shedding less of a problem in your house but you're not interested in putting the time and money into show-dog level grooming, the FURminator is a good option.